One of the hottest bands of the last five years definitely has to be “the MojoSkillet”. The Skillet is a groovy blend of four of Chicago’s first call musicians. And a perfect blend of Jim Bartholomew originals and covers of some of the greatest songwriters from a wide array of genres. It is difficult to pin a label on them as they perform music that both you and they love, but not necessarily “A” side tunes..
As lead singer, Jim Bartholomew says, “we serve up our music hot and greasy”. The best part of a MojoSkillet show is that the audience experiences the fun that these guys are having on stage, and the way that they interact with each other and the music. Combining for mix of high emotion and downright fun. Our song downloads for this month are some of these very tunes performed by the Skillet at The Vine Tastings in downtown Roselle. The Vine was a small upscale room geared to the wine drinker. 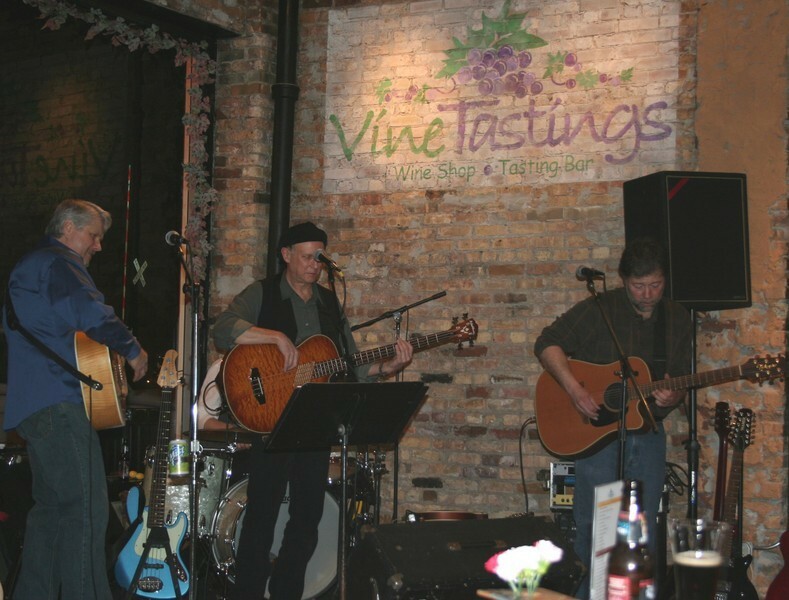 The owners of the Vine, Jan and Daryl Cooper were lovers of good wine and good music and created a perfect atmosphere for all the musicians that played there. These recordings were made on a snowy, cold, Friday the 13th in February of 2009. The night was wicked but the hearty crowd that showed up was treated to a hot night of some great tunes served up by the Skillet as only they can do. These songs were taken from the first set of the evening with the boys performing “acoustically”. The recordings were made by Jim O’Malley, a good friend of the band. This download contains three tunes, the first two are Creedence Clearwater Revival tunes, Green River and Born On The Bayou as well as the Rodney Crowell tune A’int Livin’ Long Like this. These tunes feature blistering acoustic guitar leads from Dave Steffen. This download contains the classic Up On Cripple Creek from The Band. Dave Wisniewski and Jim Nelson provide a perfect pocket for Jim Bartholomew’s great vocals, including his signature yodeling.